ARE YOU FINDING REGULAR WALKING TOO EASY ... OR TOO DIFFICULT? 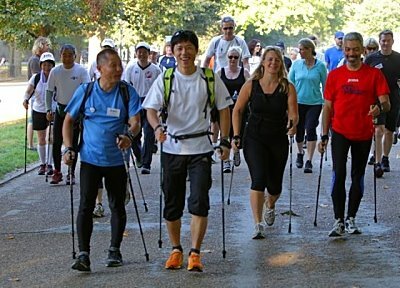 Nordic Walking is an exercise and fitness activity which uses specially designed poles during regular fitness walking. It enhances and intensifies natural walking by incorporating the use of the upper body. From this single activity, Nordic Walking gives you multiple health benefits that you would often only achieve by doing a combination of exercises, activities or sports. These include higher calorie use, improved posture, along with upper body strength and flexibility. In some cases it is comparable to running. Nordic Walking is used by Olympic X-Country Skiers, elite athletes, endurance competitors and the general population. It may also benefit people with Breast Cancer, Diabetes, Lung Disease, Neurological Conditions, Osteoporosis, Obesity, Joint Replacements and Amputation. This exercise is a smart and effective activity as it uses 90% of your muscles 100% of the time! Nordic Walking could be the perfect fitness solution for you. It is an ideal way to improve your health and fitness.